A turnaround in quality that’s so effective it’s hard to believe, The Walking Dead season 9 is the best the show has been in years. I don’t blame anyone who checked out of The Walking Dead years ago. Heck, the show was at its meandering worst as recently as The Walking Dead season 8, which saw the war with Negan come to an unceremonious end. And yet, at the same time, those who decided to stick it out with the dystopian drama for season 9 have been rewarded with some of the show’s surest storytelling in years. What will The Walking Dead movies be about? With its behind-the-scenes creative reshuffle (Angela Kang taking over from Scott Gimple as showrunner), big name departures (Andrew Grimes and Lauren Cohen exiting as Rick and Maggie respectively), and three curveball time jumps, The Walking Dead has finally discovered a late game identity that could sustain it through to season 10 and beyond. Before we get into the details of that, though, be warned that the following review contains major spoilers for The Walking Dead season 9, including its finale. Season 9 begins modestly enough, set 18 months after the events of the aforementioned war. Rick is trying to rally together the communities, including the reluctant Saviours, around the construction of a bridge that represents the first stepping stone to Carl’s posthumous vision of a harmonious future. Even during these early episodes, where the plot is deliberately measured in pace, you can tell that something is different with The Walking Dead, where laying eyes on the show’s richer tone and assured direction are like catching up with a friend who’s finally had that much needed haircut. Not everything lands during this early stage, of course (the much publicised trip to Washington D.C. turns out to be a complete non-sequitur), but the seeds of promise are firmly planted from the premiere onwards. More importantly, however, these initial chapters mark the final episodes for Rick Grimes, in which the writers do a fantastic job of showcasing the character’s best qualities before the inevitable tragedy strikes. But it’s episode 4, What Comes After, where The Walking Dead season 9 turns its zombie apocalypse up to DEFCON 5. In the lead up to Rick’s last appearance at the time, AMC had yet to announce its plans to make a straight-to-movie trilogy starring Lincoln’s noble sheriff but, even knowing that now with the benefit of hindsight, the emotional impact of this panegyric sendoff is no less debilitating. Littered with memorable cameos, smart allusions to the show’s past, and fine performances from Lincoln, Norman Reedus, and the rest of the main cast, it’s here where The Walking Dead season 9 re-earns our respect and trust as longtime viewers, confidently proving that the show has a future beyond the story of its iconic lead star. Some may have felt shortchanged by the cop out (pun very much intended) of Rick escaping death, but it’s all handled so well that you’d be silly to argue the character hadn’t earned his non-fatal exit. True to name, What Comes After isn’t content to ride off the coattails of Rick’s goodbye, but ends on a time-travelling twist, flashing our story forward several years into the future. It’s a smart surprise that acts as a statement of refreshing ambition from the showrunners, while allowing the audience to skip several potentially mundane episodes of our characters moping around grieving for their fallen friend (a Walking Dead trope that has long overstayed its welcome). The change-up isn’t a total success, though, as the following episodes are where The Walking Dead season 9 begins to sag in terms of both quality and pace. "The Walking Dead has finally discovered a late game identity that could sustain it through to season 10 and beyond"
Newly introduced characters Luke, Yumiko, Connie, and Kelly don’t make a great first introduction, initially characterised as a homogenous group rather than individuals able to interact outside of their clique, while AMC’s decision to save The Whisperers’ big debut for a mid-season cliffhanger leaves the precursive episodes struggling to generate momentum. That finale ends with the death of Jesus, which also comes across as nothing more than an arbitrary tick on the checklist of a Walking Dead season criteria. Indeed, as later episodes prove, the show no longer needs to kill off mid-tier characters so frequently to stay compelling, and this needless dispatch rings like a hollow relic of the show’s bloodier past. It’s in the latter half where The Walking Dead season 9 begins to colour in its new group of villains in more detail, but the execution of that characterisation is uneven. The Whisperers’ scare factor rides on the mystery of their strange behaviour, but Omega (the season’s worst episode by a mile) completely undermines that element of the preternatural via a series of flashbacks revealing everything about their leader, Alpha. Ezekiel and Carol’s adopted son Henry also begins to take a more prominent role in the story, yet continues to be a bugbear on audience empathy throughout the rest of season 9. Thankfully, the season quickly picks itself back up from Omega’s nosedive soon after, beginning with Chokepoint and its tense standoff against The Whisperers to the backdrop of a highrise building, culminating in a Daryl-Beta fight scene that wouldn’t look out of place in a hard-boiled action thriller. Which brings us to Scars. Every now and again, The Walking Dead drops a bombshell of an episode that reminds us why we’re still watching it in the first place, and season 9’s fourteenth is no exception. Unexpectedly taking us back to a period a few months after Rick’s disappearance, Scars is a harrowing portal into Michonne’s past, deftly explaining why her hardened posture as Alexandria’s leader comes from a place of devastating trauma. 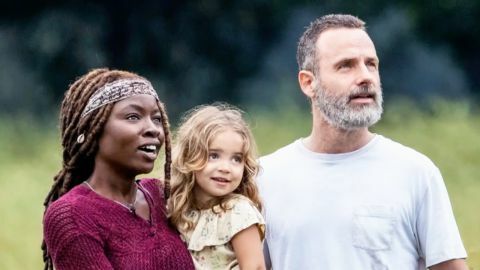 The truth is about as dark as a Walking Dead story can get, but never veers into nihilistic exploitation, contextualising the violence with thematic import and grounding it with Danai Gurira’s exceptional performance. When the show manages to walk that line between horror and humanism, its previous mistakes are mere minor chords in an elevated melody. Following Scars, season 9’s final two episodes centre around the trade fair between the allied communities but, after all that build up, the festivities turn out to be short lived. Episode 15, The Calm Before, sings to a different tune than its previous story, but is no less impressive as one of the best Walking Dead episodes of all time, masterfully pulling off a Game of Thrones-inspired tragedy with tactful pacing, exquisite cinematography, and a savvy structure that keeps viewers on their toes and constantly second guessing. Perhaps as a result of The Calm Before’s impact, the much more methodically paced (and far less dramatic) season finale, The Storm, feels almost like it should have been the Season 10 premiere. The aesthetic makeover brought on by the “Winter of Discontent”, and the narrative momentum brought by The Kingdom’s exodus to Hilltop, are welcome changes, continuing Kang’s success at aping a different movie genre with every episode (this one being a Western). Still, you can’t help but feel that the finale is somewhat lacklustre, more concerned with setting up The Walking Dead’s next season than offering anything of immediate value beyond some key moments of character development. Two years ago, during the show's darker days, I might have been angered by a season finale that treads so carefully. Given the quality of the episodes that came before it, though, The Storm is but a forgivable damp squib on season 9’s mostly exceptional run, which has successfully turned the show around from its slow motion descent into irrelevancy. Most viewers will be excited for The Walking Dead season 10 to reveal who’s on the other end of that darned radio, but - for once - it’s not just a cheap cliffhanger that’s got people hankering for more of the ageing zombie drama. When you look back on far the show’s come since the Negan era, that’s nothing short of a minor TV miracle. All images provided courtesy of AMC.